This is one of the most important archival collections in existence descibing the struggle for Women's Suffrage. Correspondence with Emily Davies, Henry Fawcett, Millicent Garrett Fawcett, Josephine Butler, Laura McLaren, Frances Power Cobbe and Priscilla Bright McLaren (they discuss at length important issues with Lydia Becker and other colleagues in the Suffrage Movement). Correspondence with leading feminists and sufragettes in America and throughout Europe. Lydia Becker's own copies (sometimes annotated) of the Women's Suffrage Journal, together with 8 volumes of cuttings covering the Suffrage Movement, 1867-1897. Papers of the Manchester Society for Women's Suffrage, including Minutes of the Executive Committee, 1912-1914, and Annual Reports, 1868-1919. This was founded by Becker, Emily Davies and Elizabeth Wolstoneholme and achieved national and international significance. 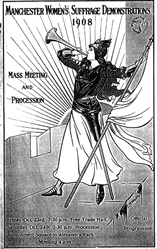 Papers of Margaret Ashton and the International Woman Suffrage Alliance, 1908-1913.